It’s easy to feel helpless in the wake of Japan’s natural disaster. But there are things you can do, even without knowing it. Various tech and social media companies are tacking relief effort support onto their everyday offers. Craving a new gaming app? Pick one up and donate at the same time. Need today’s Groupon? Add on an extra five bucks toward relief efforts. The digital age has made the world a little smaller, and giving back infinitely easier. Amidst deals for half off tapas and a discounted bar crawl, Groupon is squeezing in a way to contribute to the Japanese relief efforts. The site is currently featuring allowing users to donate anywhere between $5 and $25, 100 percent of which go directly to support the International Medical Corps’ emergency relief efforts. Being a site without any monetary based action, Twitter is limited its assistance to that of the informational kind. Instead of encouraging users to pledge donations via hashtags, the micoblogging site is instead making the most of what it’s meant to do: communicate. Twitter has created a specific blog outlining how account holders can utilize the site to effectively communicate in 140 characters or less. Such examples include hashtags indicating medical information, calls for help, evacuation notices, and even one specific for “the voices of local people [who] really need help.” Twitter has proven to be an effective means of quick communication and providing specific code to muddle through the mess of the RT site could help authorities and anyone nearby who can lend a helping hand. LivingSocial may not have made a controversial superbowl ad concerning the plight of a ravaged country, but it’s still doing its part in the wake of Japan’s destruction. 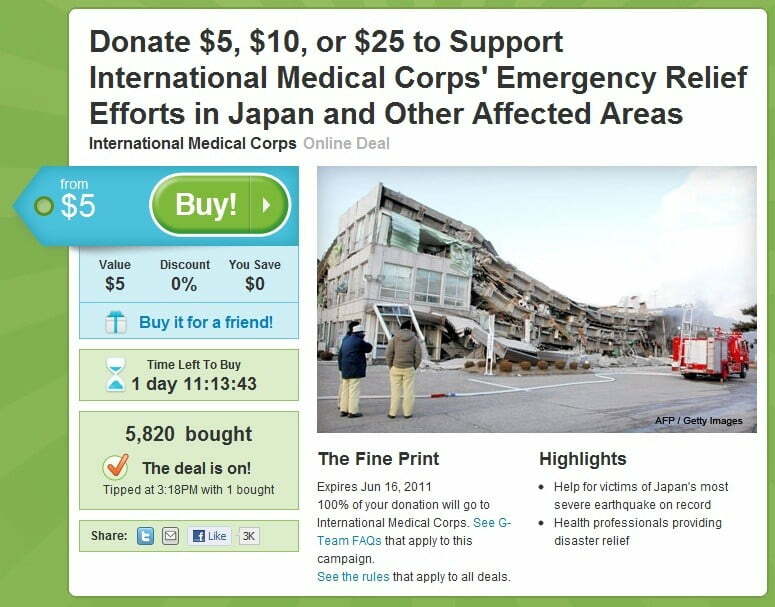 LivingSocial is working with GlobalGiving to help contribute to the cause by posting a banner on top of each coupon, requesting buyers to consider giving some of their discount-driven cash toward the people of Japan. The hordes of daily discount aggregators aren’t the only ones able to rally financial support around Japan. Apple has added a step to its digital music purchase process that gives users options for donating to relief efforts through the Red Cross. You can gift anywhere between $5 and $200 dollars, all while updating your music library. Don’t get us wrong – all things Farmville are about as annoying as they come, and in-app purchases are likened to making a deal with the devil. But in this case, the ubiquitous Facebook game and its creator Zynga will enable in-game purchases that prompt users to donate to the tsunami relief. Zynga is parterning with Save the Children’s Japan Earthquare Tsunami Emergency Fund to integrate the donation options throughout its various games, including Farmville, Cityville, Frontierville, Words with Friends, Zynga Poker, and zBar. It’s only fitting that gaming apps originating from Japanese creators will be giving back to the country in its hour of need. The beloved game Street Fight IV from Japanese developer Capcom will be charging 99 cents for the game and donating 100 percent of its profits to an unnamed charity to benefit the people of the earthquake through March 22. Sonic the Hedgehog 4 Episode I from Sega, which costs $3.99, will also be donating all of its profits from now until March 20 to benefit its nation of origin and the Red Cross Disaster Relief Efforts.